Check out our detailed guide on how to verify your site on Pinterest. Verifying and/or Confirming your site on Pinterest sounds like an overly-complicated, code heavy process and who really needs that, right? Well Pinterest site verification has many amazing benefits and doesn’t have to be hard at all! 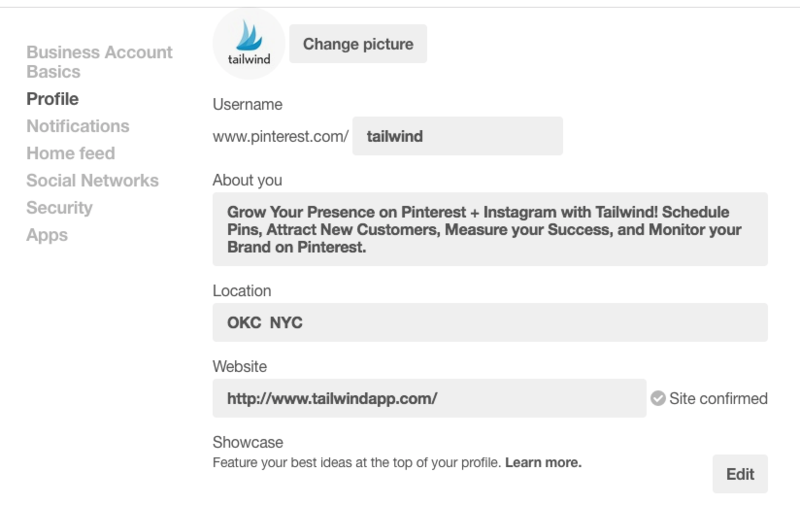 Adding your account to Pinterest gives you access to valuable business features. For example, you gain access to deeper analytics both on Pinterest and through Tailwind and your website logo will be on all Pins from your site, prompting users to visit your page. There are three main ways to go through website verification: Update the meta tag on your site, Upload an HTML file, or Add verification through a host (like Wordpress, Tumblr, Blogger). Go to your Pinterest profile and click the Edit button. 7. Click “Finish” back on Pinterest. Ta-da! Your website is now confirmed, and you'll see "Site confirmed" text instead. Great Job! 3. Click “Download This File”. Note: Once the file is downloaded, DO NOT rename the file. This is very important! 4. Upload the file to the root server. Common root servers are public_html, www, or wwwroot. This linked video will explain how to upload the file. 5. Click “Finish” back on Pinterest. Pinterest website verification can be easily done through many hosts. Right now, there are 19 total hosts with instructions on how to verify your website on Pinterest. We are only going to go over a few of the most popular ones here – WordPress, Tumblr, and Blogger. Download this linked “Pinterest Verify” Plug-in. 4. Copy the “content” section of meta tag using the instructions above. 5. Login to your WordPress dashboard. 6. Go to “Pinterest Verify” in Settings. 7. Paste the content part of meta tag into “Pinterest site confirmation” and Save. 8. Click “Finish” back on Pinterest. 4. Sign in to your Tumblr page and go to your settings, and Find your blog listed in the right rail. 5. Scroll to “Edit Theme”. 6. Click “Edit HTML” and paste meta data into <head> and save. 4. Login to Blogger and go to “Template” then select “Edit HTML”. 5. Paste Meta Tag Into <head>. 6. Click “Finish” back on Pinterest. See? Pinterest Website Verification Isn’t Too Hard! Helpful Tip! Adapted from Tailwind's Blog, Pinterest Site Verification: Easy Step by Step Guide.